Golden Horn & Bosphorus cruise along the fascinating Golden Horn with a full day tour. Visit the Pierre Loti Hill, the walls of Constantinople, Chora Church, Topkapi Gate and the Castle of Seven Tower. We offer you a great experience about Istanbul top historical attractions. Admire the sights along the Golden Horn and enjoy views of Old City. Pass through the Bosphorus Strait and discover Spice Bazaar. Golden Horn & Bosphorus Cruise along the Golden Horn, see the city’s coastline, historical churches and buildings from the sea. 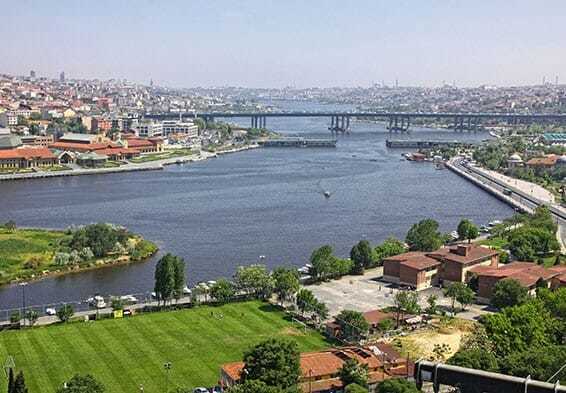 Pierre Loti Hill has one of the most beautiful views of Istanbul. When you reach breath taking Pierre Loti Hill, you will have some time to drink with the stunning view of Golden Horn. You can admire the city walls of Constantinople which are the series of defensive stone walls that have surrounded and protected the city. They were the last great fortification system of antiquity, and one of the most complex and elaborate systems ever built. Next stop is Topkapi Gate where was cannon placed by Fatih Sultan Mehmet when he conquered. The Castle of Seven Tower (no stop) was used to be a prison during both Byzantine and Ottoman Empire era. Spice Bazaar (Egyptian Bazaar), is one of the largest bazaars in the city. Located in the Eminönü, it is the most famous covered bazaar after the Grand Bazaar. It was built between 1597 and 1664, where you can find mystical smells of different aromas of various spices in the place. Enjoy the view of Istanbul from the Pierre Loti Hill and cable car to hill. Discover fascinating attractions in the city such as Spice Bazaar, Bosphorus Boat Tour.